It goes without saying that Star Wars: The Last Jedi is the most polarizing movie in the entire franchise. Many people like the film, while others downright hate it. It is not the worse movie of all time, although there are baffling decisions that have upset a lot of loyal Star Wars fans. Anyway, when I first saw Star Wars: The Last Jedi, I really liked the film. I managed to see it before most other people did so my decision was not swayed by online chatter. However, after seeing the movie for a second time, I have to admit that there are lots of faults that prevent this movie from being great. Since the movie has been out for a week now, I can now talk freely about spoilers and discuss the specific parts I both liked about the film and the parts that I disliked about it. Watch the movie first if you don't want to be spoiled though. Pro 1 - Character Development: One of the best things that Star Wars: The Last Jedi does is develop the main characters. Specifically, Rey and Kylo Ren get the most shine here. Kylo Ren is my favorite character in this movie because he goes through a lot of changes. Yes, he killed Han Solo in The Force Awakens, but he hesitated in killing his own mother Leia Organa. Not to mention he found enough courage to kill his master Snoke and wanted Rey to join him. Rey on the other hand shows us to never give up. Luke Skywalker gave up and wanted to die after he felt that it was his fault that he created Kylo Ren in the first place. Rey on the other hand didn't want to give up on Kylo Ren as she felt there was still a bit of Ben Solo left in him. The movie also surprisingly gave us a lot about Poe Dameron. This movie showed us the failures of his character, but his mistakes ensure that he will be a great leader by the time Episode IX comes out. Pro 2 - Snoke Dying Prematurely: Unlike many other people on the internet, I actually liked the fact that Snoke kicked the bucket early. Sure we never got to know who he was, or where he came from but his death makes sure that Kylo Ren is the main bad guy in Star Wars: Episode IX. One of the criticisms about The Force Awakens was that it recycled too heavily from A New Hope. If Snoke was kept alive, it would have mirrored the original trilogy too much with Snoke being The Emperor and Kylo Ren being like Darth Vader who turns on his master. With Snoke out of the picture entirely, Kylo Ren is the only bad guy with Force Powers so he can be his own boss. It can take Episode IX into new territories exploring Kylo Ren's further path to the Dark Side as The First Order's true leader now. It was also a very unpredictable scene because nobody knew Snoke was going to die so easily. Unpredictable moments are usually rare in modern day blockbuster movies. Pro 3 - Trying Something Different: Another thing I admired is director Rian Johnson not being afraid to try something different. In the movie, he introduced us to new Force powers that were never portrayed in either the prequels or the original trilogy. He even had the guts to write a different side to Luke Skywalker that we have never seen before. Sure some people will say Luke acted 'out of character' although watching the movie a second time you can see Luke refrained from his obsession and hesitated at the last second from killing Ben Solo. If you see this from Luke perspective, he may have seen Ben Solo's future with lots of people dying in the process. It's kind of like a killing Hitler as a child scenario. Sure many people would want to go back in time and kill Hitler as a child, although it will still feel morally wrong because he hasn't done anything bad yet. This is the type of scenario Luke was facing when he knew Snoke was messing with his nephew/student. Should he end a dark future now or face the inevitable consequences? Pro 4 - Visuals and Audio: People may disagree with the story and characters of Star Wars: The Last Jedi, but almost everyone can agree that this is an awesome movie to watch on the big screen from a cinematic point of view. The special effects in this movie are great with my favorite scene being Kylo Ren and Rey using lightsabers to kill a bunch of Praetorian Guards. The scene where Admiral Holdo sacrifices herself to crash the Star Destroyers is also a visual treat. The sound effects are also amazing during the epic action scenes. Not to mention John Williams is back giving us a memorable score for us to listen to once again. Con 1 - Luke Skywalker Dying: One of the biggest bummers about Star Wars: The Last Jedi is that Luke Skywalker dies. This is sad mainly because we only saw the character return after 30 long years. Since Luke Skywalker was only in The Force Awakens for less than 30 seconds, many fans were happy to see him finally return in The Last Jedi. However, Rian Johnson decided to kill him off even though Star Wars: Episode IX will still be released in 2019. I think Rian Johnson jumped the gun too early and should have allowed Luke Skywalker to live at least one more movie. With Luke's death, none of the original trio will be in Star Wars: Episode IX as Luke will just be a Force Ghost. As you may know, Carrie Fisher died in real life so General Leia is not going to be in Episode IX. Harrison Ford always wanted Han Solo to die so he's not coming back too. I feel sad for Mark Hamill because unlike Ford, he loves Star Wars and wanted to play Luke Skywalker in more movies. The only original character that can come back in a physically alive form (both in real life and the story) is Lando Calrissian. Billy Dee Williams said he's happy to return so they should bring him back! 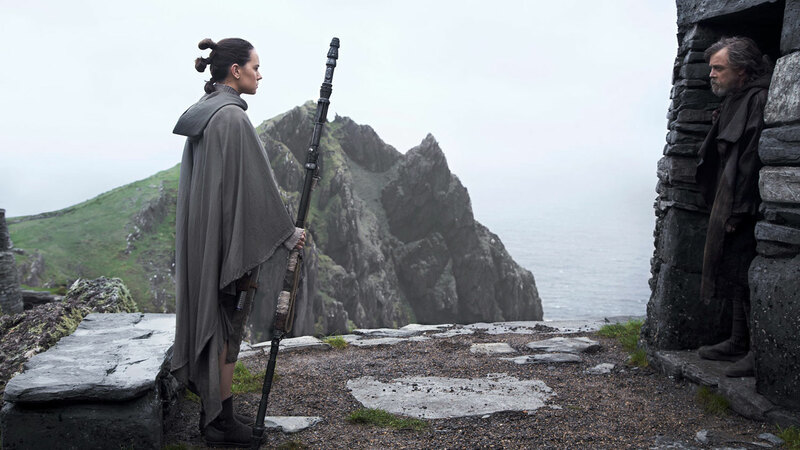 Con 2 - Side Stories Lead To Nothing: Aside from Rey and Kylo Ren, the other characters in The Last Jedi do not accomplish anything other than just run away from The First Order to live another day. I still don't get why Admiral Holdo didn't tell Poe Dameron her real plan on keeping The Resistance alive. By withholding this information to Poe, Holdo potentially put more lives at risk. She should have just told everyone the truth from the beginning so Poe wouldn't have acted so rashly. Finn and Rose are cool characters, but their side story goes nowhere too. They fail at their mission for destroying The First Order's tracking system when DJ betrays them. Con 3 - Superman/Mary Poppins Leia: This is a scene that even fans of the movie don't like too. My friend loves The Last Jedi, but even he admits that this scene is absolutely ridiculous. If The Force Awakens showed us that Leia had been using the Force for the last 30 years, then this scene would have been received better. However, they didn't tell us Leia was strong with the Force so her Superman/Mary Poppins stunt looked out of place. Con 4 - The Force Awakens' Mysteries Are Never Revealed and/or Ruined: One of the biggest mysteries set up in The Force Awakens was guessing who Rey's parents were. JJ Abrams teased us because he never gave us Rey's last name so many people were guessing who she might be related to. Well it turns out her parents are nobodies and they didn't even show us what they looked like either. Alas, Kylo Ren could still be lying to Rey so JJ Abrams could reveal her real parents in Star Wars: Episode IX. That said, it is still an underwhelming reveal if they stick with this current storyline. Another thing I wanted to know was how Maz Kanata got a hold of Anakin's lightsaber. That lightsaber was last seen in The Empire Strikes Back with Luke's hand being chopped off his body. We never get any details about the lightsaber. Not to mention, we also don't get to know why Rey had those weird visions in The Force Awakens either. The last thing that bugged me is that the film never talks about the Knights of Ren. The Knights of Ren are possibly other Jedi students that Kylo Ren recruited to join the Dark Side. However, they are not referred to again in The Last Jedi which is sad. Hopefully they appear in Episode IX as there must be more evil Force users out there if they are all still alive. Bottom Line: The more I think about Star Wars: The Last Jedi, the more I see its flaws. Yes, the movie has awesome and great moments, but the negatives are hard to ignore. Hopefully JJ Abrams is able to make Star Wars: Episode IX better so fans can look forward to the future of the Star Wars franchise in a more positive way. Wanna read more on this? Check these out: Fifty Shades Freed Certified Rotten On Rotten Tomatoes Website (more); First Venom Teaser Trailer Shows Only Tom Hardy's Eddie Brock (more); The NBA And ESPN Announce The Full Teams For The 2018 Celebrity All-Star Game (more); The New Deadpool 2 Teaser Trailer Looks Funny And Entertaining (more). And here are some more related articles: The Rotten Tomatoes Rating For The Cloverfield Paradox Is Abysmal (more); Full Trailer Released For Dwayne 'The Rock' Johnson's Skyscraper Movie (more); See New TV Spots/Trailers For Avengers: Infinity War, Jurassic World 2 And Mission Impossible 6 (more). A few more: The Cloverfield Paradox Releasing Exclusively On Netflix Tonight After The Super Bowl (more); First Footage For Solo: A Star Wars Story TV Spot Drops Online; Hasbro Toy Descriptions (more).